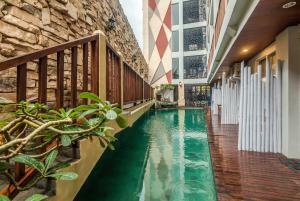 Hadi Poetra Hotel - Kuta, Bali, Indonesia - Great discounted rates! 7.3 out of 10 based on 137 verified user reviews via Agoda. The 3-star Hadi Poetra Hotel offers comfort and convenience whether you're on business or holiday in Bali. The hotel offers a wide range of amenities and perks to ensure you have a great time. All the necessary facilities, including 24-hour room service, free Wi-Fi in all rooms, 24-hour front desk, luggage storage, Wi-Fi in public areas, are at hand. Designed for comfort, selected guestrooms offer television LCD plasma screen, internet access ?ÛÒ wireless (complimentary), non smoking rooms, air conditioning, wake-up service to ensure a restful night. Recuperate from a full day of sightseeing in the comfort of your room or take advantage of the hotel's recreational facilities, including outdoor pool, massage. Friendly staff, great facilities and close proximity to all that Bali has to offer are three great reasons you should stay at Hadi Poetra Hotel. Hadi Poetra Hotel - Bali classifies itself as a 3 star hotel.